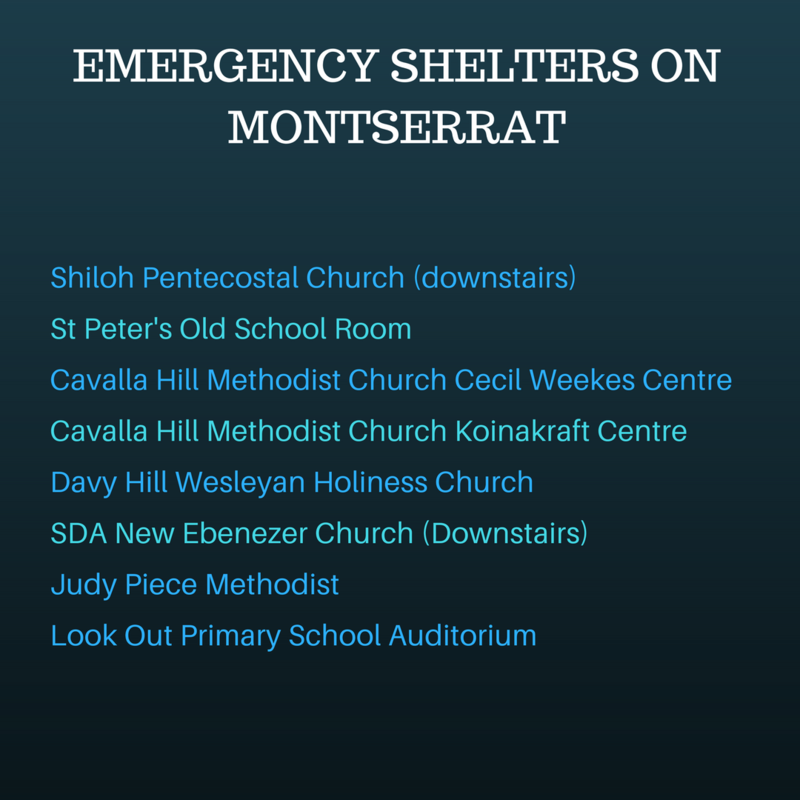 The hurricane shelters around Montserrat are now open. Sirens across the island sounded at 6PM indicating residents could now proceed to the facilities identified as safe for the passing of Hurricane Maria later tonight. According to disaster management officials, those in need of a ride can call the DMCA at 491-7166 or 491-3064. No pets are allowed in the shelter. Each person should bring with them non-perishable food items enough for 48 hours and enough water for each family member. No smoking or drinking of alcoholic beverages is permitted in the shelters. Acting Director of the DMCA Carlysle Williams said residents are asked to stay off the roads after midnight as this is when the island should begin to feel the effects of the hurricane. Sirens will be used when necessary to provide alerts. At 800 PM AST (0000 UTC), the eye of Hurricane Maria was locatedÂ near latitude 15.3 North, longitude 61.1 West. Maria is movingÂ toward the west-northwest near 9 mph (15 km/h), and this generalÂ motion is expected to continue through Wednesday. On the forecastÂ track, the core of Maria will move near Dominica and the adjacentÂ Leeward Islands during the next few hours, over the extremeÂ northeastern Caribbean Sea the remainder of tonight and Tuesday, andÂ approach Puerto Rico and the Virgin Islands Tuesday night andÂ Wednesday. Maximum sustained winds are near 160 mph (260 km/h) with higherÂ gusts. Maria is a category 5 hurricane on the Saffir-SimpsonÂ Hurricane Wind Scale. Some additional strengthening is possibleÂ tonight, but some fluctuations in intensity are likely during theÂ next day or two. Hurricane-force winds extend outward up to 25 miles (35 km) from theÂ center and tropical-storm-force winds extend outward up to 125 milesÂ (205 km). The estimated minimum central pressure based on Air Force HurricaneÂ Hunter data is 925 mb (27.32 inches). At 500 PM AST (2100 UTC), the eye of Hurricane Maria was locatedÂ by satellite imagery and data from the French radar on MartiniqueÂ near latitude 15.1 North, longitude 60.7 West. Maria is movingÂ toward the west-northwest near 9 mph (15 km/h), and this generalÂ motion is expected to continue through Wednesday. On the forecastÂ track, the center of Maria will move near Dominica and the adjacentÂ Leeward Islands during the next few hours, over the extremeÂ northeastern Caribbean Sea the remainder of tonight and Tuesday, andÂ approach Puerto Rico and the Virgin Islands Tuesday night andÂ Wednesday.